Hello! Second and final post on my recent trip to Morocco - promise. If I had to pick my favourite moments of the holiday there are definitely a few that stand out. 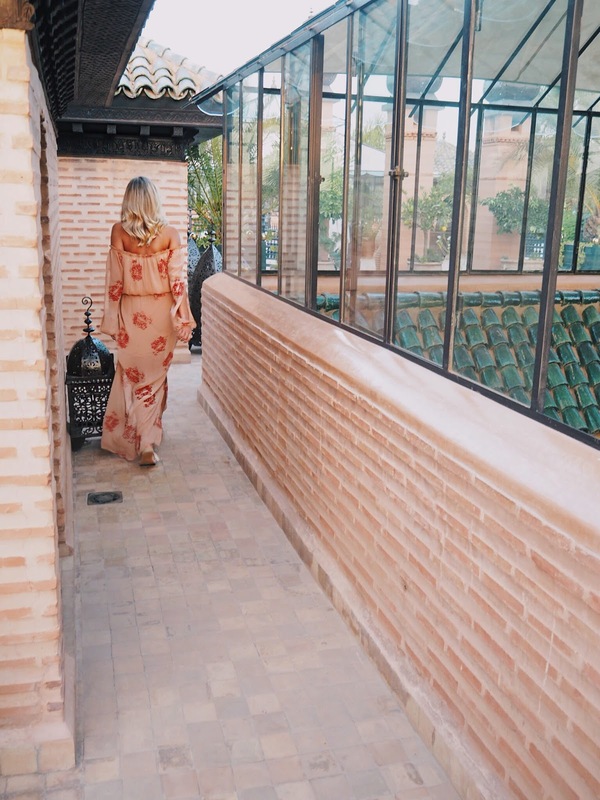 One of the key things that we had on our list of "to-dos" was to visit a traditional hammam. For those who don't know, this is basically a Moroccan style spa with certain treatments included. 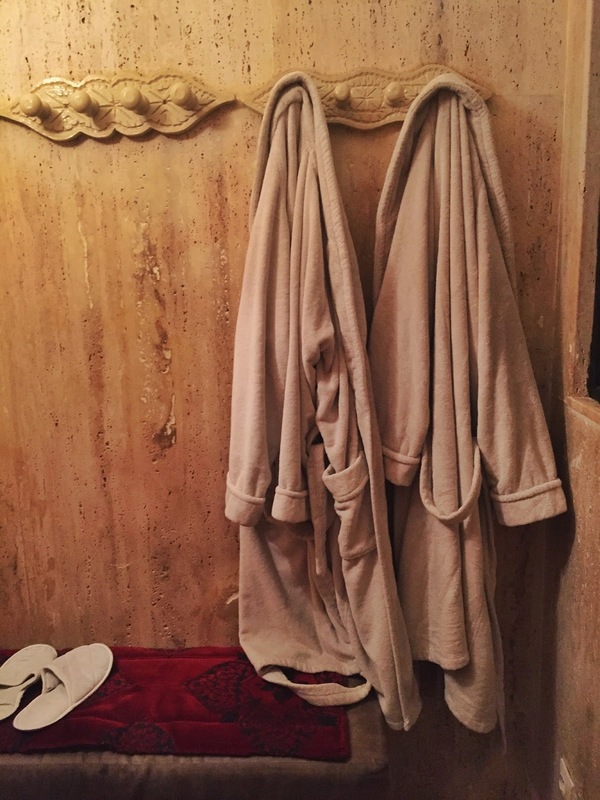 We opted for a full package to really experience a typical hammam in the heart of the city. It was a three stage process, starting with an initial body scrub using eucalyptus and spices. We were then taken into an adjoining room where we lay down on a bed, drank mint tea, and had a brief foot massage. By this point I felt like I had lost around a stone in dead skin that had previously been vigorously rubbed off, whilst simultaneously stressing my tan had been and gone forever. From here we were moved into a relaxation room and were given a full (and by full - I mean full) body massage. I have to admit it was one of the best massages I have had, and I felt fully prepared to continue my stint of relaxation on the sunbed that afternoon. I just HAVE to mention the taxi rides that we took when we were navigating through the medina. I felt like I had stepped back in time. They felt so old and even had fur on the dashboards! It gave me a glimpse of what I would expect Cuba to feel like (a place that is definitely on the list for next year!). 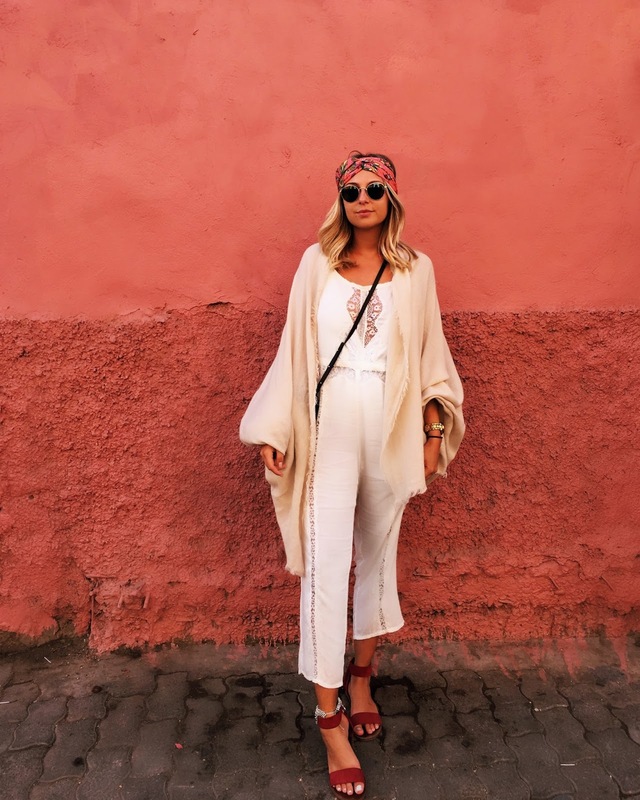 In order to try and avoid the risk of overheating in the 36 degree heat, my outfit choices seemed to consist of floaty maxi skirts and loose fitting jumpsuits (backless, to let that extra bit of fresh air in!) for my explorations around the red city. It's no secret for those of you who read my travel posts and follow my Instagram, that I am a big advocate for a rooftop bar. Pair this with a bottle of wine and an array of snacks - and I am sold! 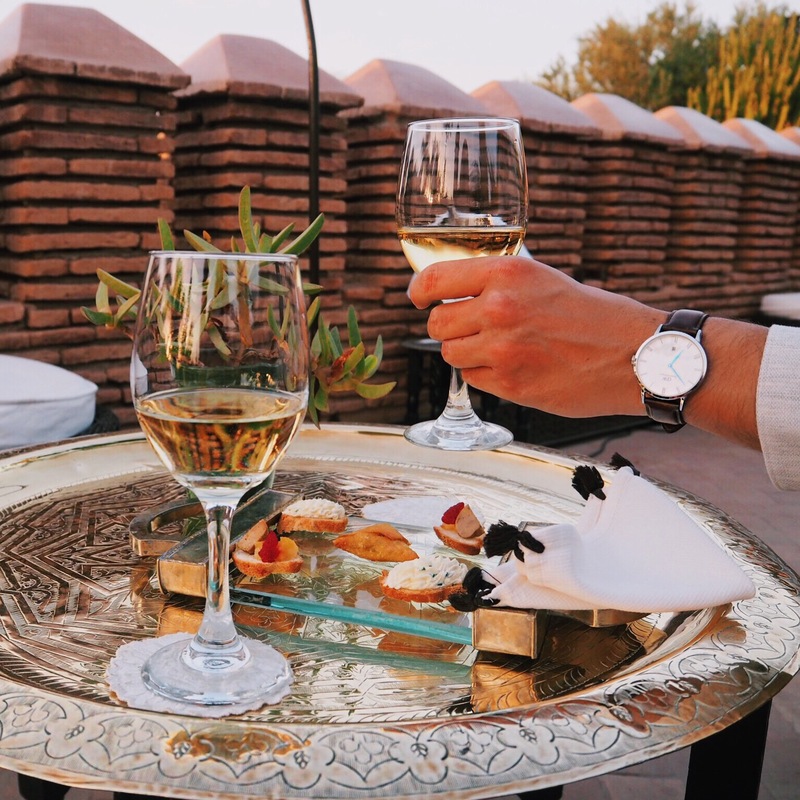 La Sultana, which is the rooftop bar shown in the above photos, is one of my favourite places I have visited. We went to watch the sunset over the medina - which was just so peaceful and surreal. 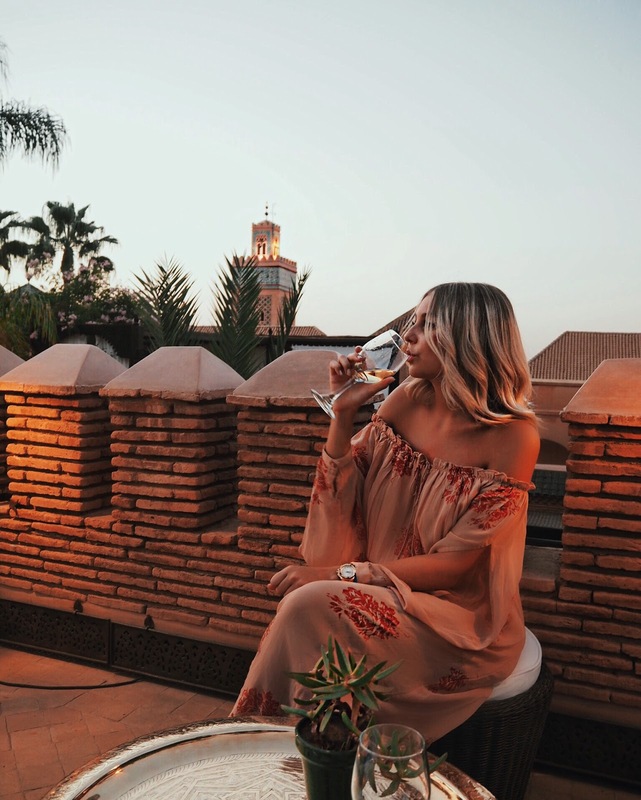 I always try to do a degree of planning when it comes to my outfit choices for a new place I am visiting, so opted for a floaty off the shoulder dress for this classic terrace moment. 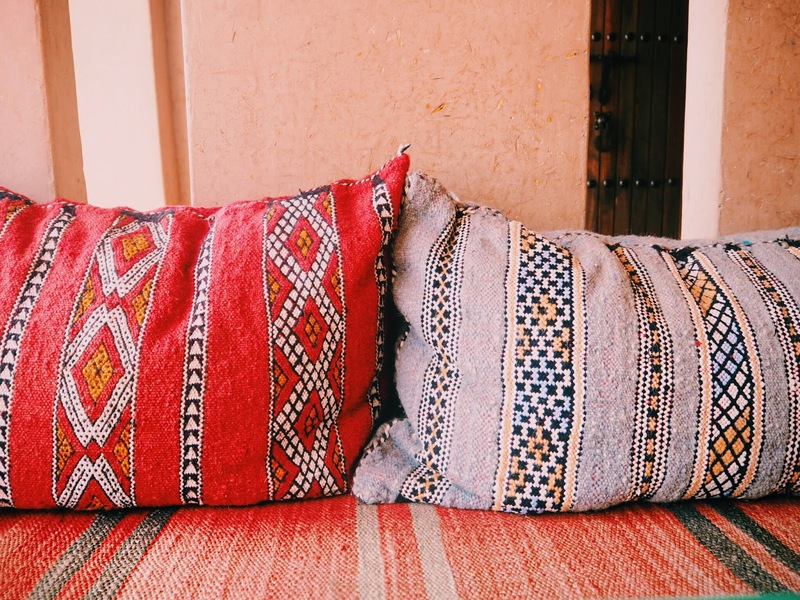 You'll also see a picture of the intricate detail shown on a row of pillows, because well, why not?